Mamacado: Valentine's Day Giveaway - Make Sure to Enter Today! 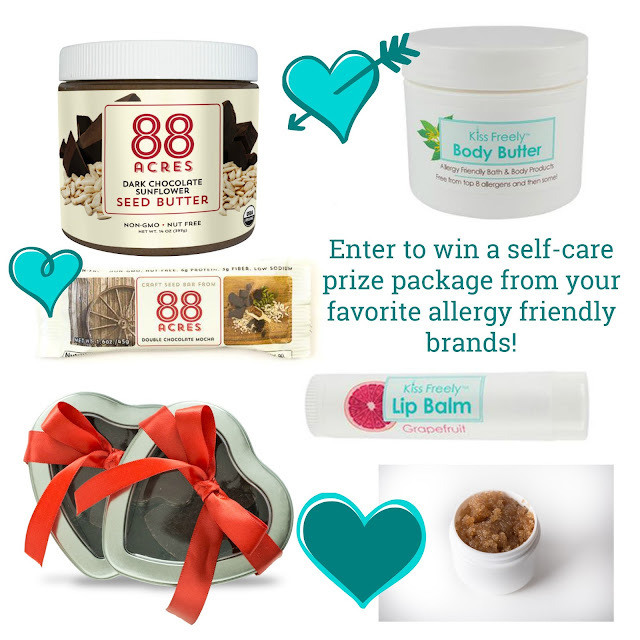 Valentine's Day Giveaway - Make Sure to Enter Today! I have a fun Valentine's giveaway going on right now that you might just LOVE!💕 Pop over to my Instagram page and be sure to enter today. Umm, can you say ooh, ahh and yum!? I'm so glad that I get to do this with two of my favorite food allergy friendly bloggers too, Sharon Wong of Nut Free Wok and Kelly from The Pretty Bee Blog! Oh, and if you're looking for Valentine's Day ideas for school parties, or just something to make for your family or little ones, check out my Valentine's Pinterest Board. I'm always searching for and pinning new ideas! This year I'm bringing these SunButter Chocolate Heart cookies to Little Guy's Valentine's school party (along with popcorn and fruit salad). I've made these for the past 3 years and everyone just LOVES them. They don't even know they're vegan and nut free (they do taste like chocolate peanut butter cookies!). I may also make these heart-shaped pancakes for the fam. And don't forget about these fun printable Valentines that go well with any allergy-friendly lollipop or sweet! Hope you have a joyful and loving Valentine's Day next week. That's what it's all about, right?